The starry nights were amazing. 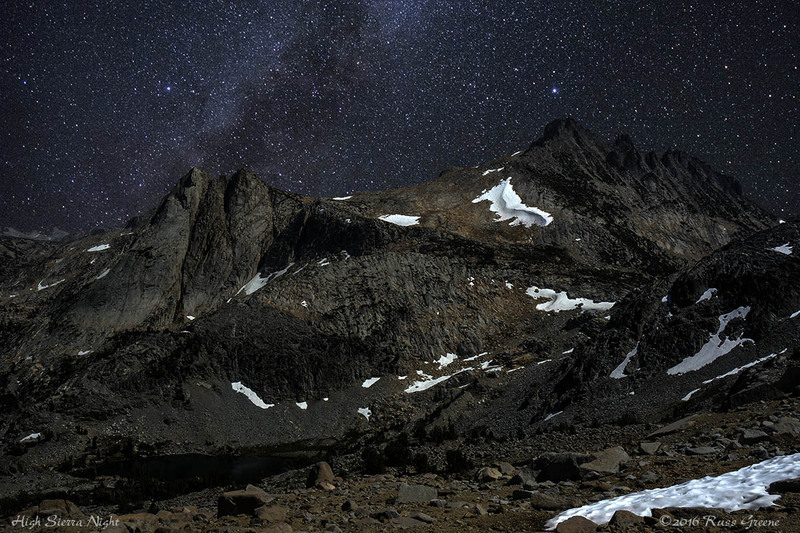 We were camped at 9400′, miles and miles from the nearest city lights. The Milky Way was clearly visible. Plus, we were there during the Perseid meteor shower. We slept under the stars and set the alarm for 2 AM. Over the next hour we saw dozens and dozens of shooting stars.” width=”300″ height=”200″ /> The starry nights were amazing. We were camped at 9400′, miles and miles from the nearest city lights. The Milky Way was clearly visible. Plus, we were there during the Perseid meteor shower. We slept under the stars and set the alarm for 2 AM. Over the next hour we saw dozens and dozens of shooting stars. One thing I think is sometimes overlooked when talking about the adventure of RVing is that sometimes an RVing destination is a jumping off point for another kind of adventure. 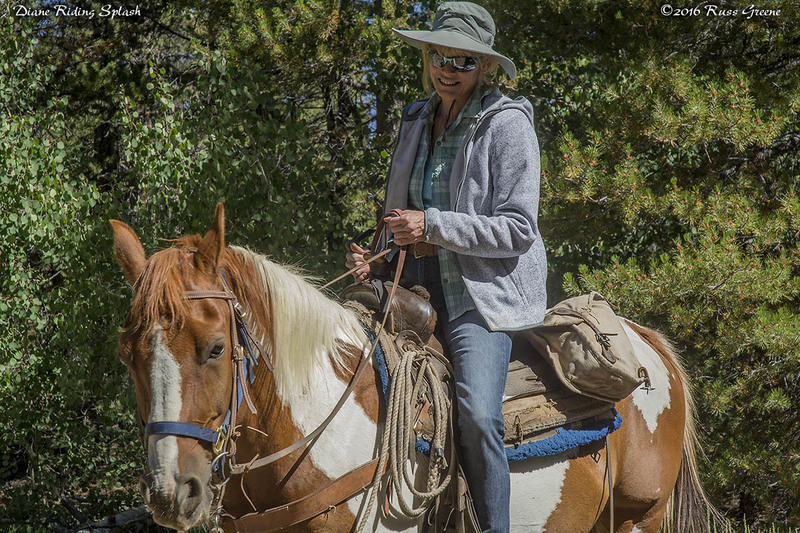 For example, I recently returned from a wilderness adventure into the high Sierra back country of the the Humboldt-Toiyabe National Forest in the Sierra Nevada mountains of California. The area I visited was in the Hoover Wilderness just north of Yosemite National Park. This trip took me to elevations above 10,000’, 20 miles from the nearest road–an area that as a younger man I backpacked to but in recent years have gone in via “four hoofed RV”. We traveled five and a half hours, 18 miles through the mountains to get to our camp on our 4-hoofed RVs. Man, were we sore! Going where I did–I should say “we” as I was with my girlfriend, Diane–requires overland travel by foot or hoof. There’s no other way to get there. With snow capped granite peaks, crystal clear and shimmering blue mountain lakes, and more stars than you could possibly count in 100 lifetimes the scenery is spectacular, second to none. Besides the horses we rode into the wilderness we had two mules that carried our stuff. This allowed us the luxury of things such as an ice chest, a camping table, and chairs upon which to sit and gaze endlessly at our stunning surroundings. Note the Bodum Travel Press French Press coffee makers we each had. There’s an exciting element of adventure to a trip like this too because you really are in the middle of nowhere, with no phones, no electricity, no running water other than mountain streams. There are no corner stores, no stores of any kind, no restaurants, no doctors or hospitals, no help of any kind and no way to contact anybody short of hiking two days through the mountains to the highway, if you can find it. 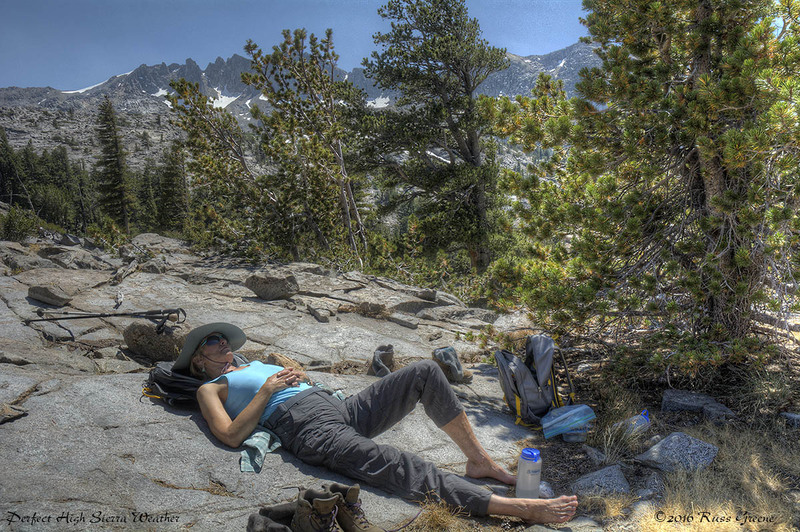 On one of our day hikes we stopped for lunch and to soak up some rays… man, the weather was awesome! 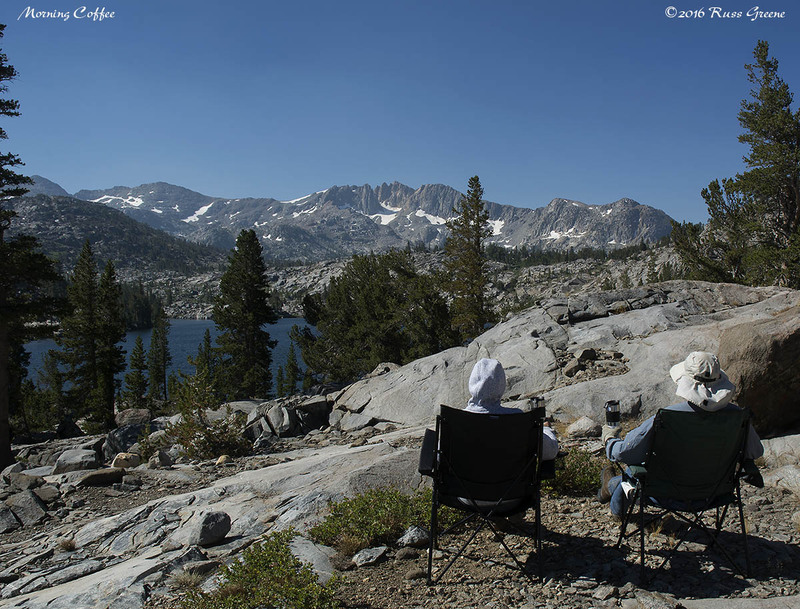 There’s more to tell about this back country adventure, but getting back to the opening thought of this article, this high Sierra escapade was truly amazing and in ways the total antithesis of RVing itself. On one hand, in an RV you might have all the conveniences of a sticks and bricks home: a fully equipped kitchen and bathroom, bedroom with a cushy king-size bed, heating and air-conditioning, lighting, TV, phone service and more. On the other hand, in the wilderness you have none of that. Your kitchen is a camp stove pot and pan, your bathroom is behind the nearest tree, you sleep on the ground, your heating and air-conditioning come in the form of whatever the weather happens to bring and your lighting is controlled by the sun and moon. It’s RVing, however, that allows people to travel to places that such wilderness adventures become possible. RVing with all its comforts and conveniences allows us to experience the wilderness with all its rugged beauty by providing us the means by which to travel to it. It’s the collision of two vastly disparate yet complimentary worlds. 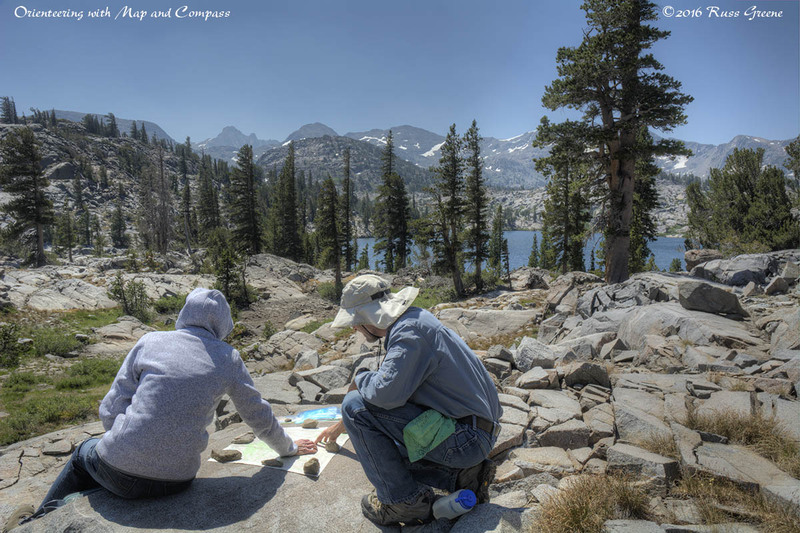 Orienteering is the art of getting around out in the wild with a map and compass as your guide. This is a lot of fun for me. I enjoy getting off the trail and seeing things you’ll never see unless you go cross-country off trail. Here I’m acquainting Diane with the basics of plotting a course and determining your location. For all of you coffee lovers one of the things I just have to mention is our discovery of the Bodum Travel Press. I’m fussy about my coffee and Diane refuses to do anything until she gets her morning cup. How, we wondered, were we going to make great coffee in the middle of nowhere? Enter Bodum’s single serving French press/thermos combo they call a travel press. We got the double-walled stainless steel model–the plastic ones tend to break and aren’t well insulated. We each had our own. Put in your coffee grounds, add hot water, stir a few seconds, screw on the cap and in four minutes press the plunger. Fresh, delicious, way good hot coffee that will stay hot. Great for commuting too! Few, very few high Sierra back country lakes actually have a beach of any sort, let alone one big enough to spread out a blanket. Sure, I could tell you where this is, but then I’d have to kill you. LOL. Our high Sierra adventure lasted a week. We had some windy days, but they were all sunny and warm. At night the skies were aglow with the stars. Some days we lazed around camp and the beach. Others we went on day hikes. When we wanted fresh trout for dinner all we had to do was hold a frying pan out over the lake and they jumped into it… well, practically, anyway. The fishing was amazing. So, while RVing is sometimes about getting to the final destination, sometimes it’s about getting us to the jumping off point for another kind of adventure can begin.